Design program won't let me order a light .500 bullet mold! I want to experiment with my .500s on bowling pins. 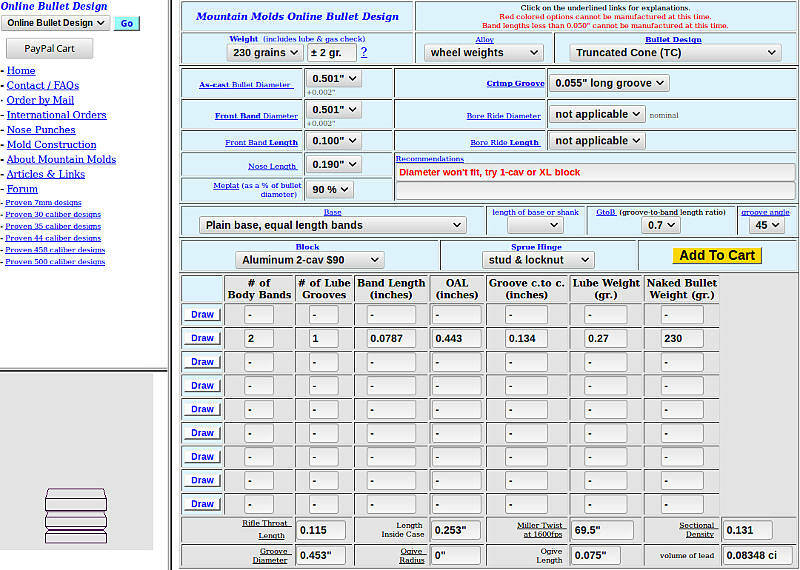 I'd like a 230 grain truncated cone design with 90% meplat and .250" nose length. I spec'd XL 2 cavity, but then in red it says "Use std. 2-cav or XL 3-cav block if weight is less than 300 grains," but if I switch to the std. 2 cavity, it says "Diameter won't fit, try 1-cav or XL block," and if I switch to XL 3 cavity, it says "Won't fit, try a different block." FWIW I'd like the most # of cavities possible. I thought this was 2 for .500" diameter bullets, but 3 would be great. Re: Design program won't let me order a light .500 bullet mold! Hello John, good to see that you are still around. The design program follows rigid numerical rules that make sense most of the time but perhaps not all the time. In addition to the 300 gr. minimum for the XL block, there is yet another rule about minimum band size for each caliber. The program displays only one warning at a time even if multiple rules have been violated, so you may address one violation only to discover that another rule violation is waiting for you. The lightest bullet it would let me make with your 90% meplat and 0.250" long nose was 270 gr.. It's bands were 0.0787" long. How long would the bands be on a 230 gr? Well, it won't tell us but I bet they would not be long enough to make the program happy, which requires a minimum of about 0.075" long bands for 500 caliber. Plus, we are still stuck with a bullet that is too light for the XL 2-cavity and too big in diameter for the standard 2-cavity. 50 caliber definitely does not fit comfortably in the XL 3-cavity, and 230 gr. will cast very poorly in the 2-cavity XL. I have occasionally bent the rules to put light 50 caliber bullets in the standard 2-cavity and that is what I would suggest in your case. That still leaves us with the question about band layout since the program will not even allow us to create a 230 gr. bullet with a decent lube groove. By trial and error, I was able to create a 230 gr. with 90% meplat providing I shrunk the nose length to 0.190". That shifted more weight to the bottom half of the bullet so that the bands would meet the 0.075" minimum. A 0.7 GtoB provides an adequate lube groove. If you want to sketch some alternative band layout, I might be able to cut it, or not, just depending. I'd be willing to go as small as 0.060" bands on your light bullet. I'm guessing that even 0.060" long bands would still exceed 230 grains with your original 0.250" long nose so it seems like some nose changes are necessary to hit 230 gr. -- either a smaller meplat or a shorter ogive to reduce weight on the nose. As for the block issue, I would be willing to put a light 50 caliber in the 2-cavity standard block. Once we agree on a design you can either snail mail the order or else I can send you a paypal invoice. What you have shown looks fine, I'll take a two cavity just like that. I'm having issues with my Paypal account right now but hope to get it sorted in a day or two. Richard Davis started his pin shoots back up June 2017 after a 15+ year hiatus, and he has several classes that I can compete in with my various .500s, including a "concealed carry" event limited to guns with barrels no longer than 3.5", a revolver event requiring a reload (8 pins with a maximum of 6 rounds in the gun to start, so I'm having one .500 set up for moonclips), and a "Big Push" event where you must send 3 pins 14 1/2 FEET off the table. P.S. I mis-typed in my original post. The bullet I had designed that gave me the error messages had a .200" nose length, not .250", so your suggestion is virtually identical to what I originally envisioned.